""other generations besides our own will honour its deeds." n 25 March 1942 the 376th Field Artillery was reactivated and reorganized at Camp Claiborne, Louisana. Later that year on 16 August 1942 the 376th was redesignated the 376th Parachute Field Artillery Battalion (PFAB) and attached to the newly designated 82nd Airborne Division under General Omar N. Bradley. They would train for the next 11 months before they would see action under the command of Lt Col Wilbur Maben Griffith (picture left), who took command of the 376th Parachute Field Artillery Battalion in November of 1942 . In September of 1944, Lt Col Griffith became Division Artillery Executive Officer of the 82nd Airborne Division, a position he held until war's end. The 456th PFAB Executive Officer, Major Robert H Neptune, was promoted to Lt Col and assumed command of the 376th PFAB until the end of the war. After arriving in Casablanca, French Morocco on 10 May 1943, the 376th PFAB began the gruelling preparations for the drop into Sicily from their base in North Africa. After a day of heavy fighting, Patton decided to reinforce his battle-weary center with over 2,000 additional paratroopers from his reserves in North Africa. He ordered that the 1st and 2d Battalions, 504th Parachute Infantry Regiment (PIR), the 376th PFAB, and Company C from the 307th Airborne Engineer Battalion be dropped near Gela on the night of 11 July. Finally, On the night of 11 July, the 376th PFAB along with the 504th PIR and Company C 307th Airborne Engineers were ordered to jump on Farello Airstrip, which was held by the Americans. However, disaster soon struck. When the transport planes arrived over the beaches in the wake of a German air raid, nervous antiaircraft gunners ashore and afloat opened fire with devastating effect. Allied antiaircraft guns shot down 23 and damaged 37 of the 144 American transport planes. The airborne force suffered approximately 10 percent casualties and was badly disorganized. Later investigation would reveal that not everyone had been informed of the drop despite the Seventh Army's best efforts. After Sicily the 504th PIR,the 376th PFAB and Company C 307th Airborne Engineer Battalion were formed into the 504th Regimental Combat Team (RCT) and fought together throughout the rest of World War II. To outflank the German defenses along the Gustav Line, an amphibious invasion at Anzio was planned. Assigned as part of the invasion force was the 504th Regimental Combat Team (RCT), consisting of the 504th PIR, the 376th PFAB, and Company C, 307th Parachute Engineers. 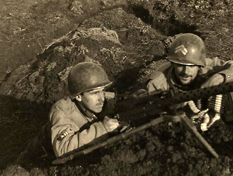 The 504th RCT had been fighting as "leg infantry" during the advance towards Rome until pulled from combat on 4 January 1944 to prepare for the Anzio operation. The 504th RCT was assigned to seize the town of Borgo Piave on 24 January. Although successful they were soon driven out by German tanks and artillery. They then held a defensive position along the Mussolini Canal until relieved on 28 January. In late March the 376th was withdrawn to England to rejoin the 82nd Airborne in preparation for the Normandy landing. On 9 September 1944 Field-Marshal Montgomery proposed a plan, called Operation Market Garden, to secure a bridgegehead across the Rhine. The operation called for a combined armor and airborne assault to seize and hold key bridges and roads deep behind German lines in Holland. The airborne phase of the operation consisted of capturing five bridges ahead of the armored force. The 504th RCT now back at full strength rejoined the 82nd, while the 507th went to the 17th Airborne Division. The 504th's mission was to capture two bridges across the Maas-Waal Canal. The operation began on 17 September. The 504th RCT quickly secured one of the most important objectives, the nine-span bridge over the Maas River, by hitting both ends simultaneously. On 20 September the 504th carried out an heroic assault crossing the Waal. With artillery support the first wave of the 504th RCT assaulted, in twenty-six assault boats, under intense fire, taking 200 casualties in the process. Finally on D+4 the 504th RCT finally secured their hold on the bridge, fighting off another German counterattack just before noon. It was in this skirmish that Pvt. John Towle won the Medal of Honor. The Regimental motto, "Strike Hold," had never before been more forcefully demonstrated on the battlefield. The 504th RCT, tired yet determined, had gallantly kept its commitment to accomplish every mission without ever relinquishing any ground it had once occupied. Its success, however, was short-lived because of the defeat of other Allied units at Arnhem. The gateway to Germany would not open in September 1944, and the 82nd was ordered back to France. Suddenly, on December 16, 1944, the Germans launched a surprise offensive through the Ardennes Forest which caught the Allies completely by surprise. Two days later the 82nd joined the fighting and blunted General Von Runstedt's northern penetration in the American lines. On the morning of 19 December the 504th RCT was getting into position north of Bastogne, while the 101st Airborne Division was assigned to Bastogne itself. The Germans quickly infiltrated and cut off the road between the two elements and the "Battle of the Bulge" offensive flowed around the two airborne units. The 82nd as a whole faced great difficulty in holding position along the northern edge of the German penetration. The 504th RCT faced particularly heavy German attacks, winning their second Presidential Unit Citation in the process. Driving deep into the heartland of Germany, the 504th RCT finally took up positions along the West Bank of the Rhine River. Then on 6 April 1945 A Company crossed the Rhine near the village of Hitsdorf as a diversionary tactic to mislead the Germans from the full scale crossing. The fierce fighting which ensued won A Company a Presidential Unit Citation. The war offically ended in Europe on 5 May 1945 and the 82nd Airborne Division was called upon to serve as the occupation force in the American Sector of Berlin. Here the 82nd Airborne Division earned the name, "America's Guard of Honor," as a fitting end to hostilities in which the 504th RCT had chased the German Army some 14,000 miles across the European Theater.